RMC Wah pedals are sometimes backordered. 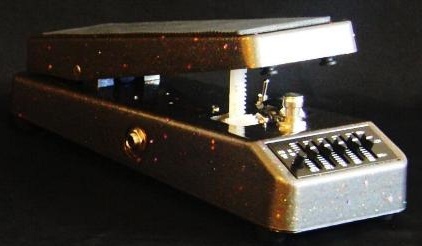 Analog Man Guitar Effects Pedals sells the new RMC8 Guitar Eqwahlyzer wah by Geoffrey Teese. Classic Italian wah design with tone shaping options to get the EXACT wah sound that will work with your setup. What do you think of when you're asked, “What's the best sounding wah-wah pedal ever?” You know the answer. The old Italian built originals. The classic Brad Plunkett circuit. Simple. Everybody knows it. Yet everybody has their own sonic picture of what that perfect classic Italian wah-wah pedal's sound is. More bottom end. Less bottom end. Richer mids. Thinner mids. Bright top end. Smooth top end. A slow, articulate sweep. A fast, snappy sweep. You know what it is. You've known it for a long time. It's inside you. It's personal. You'd know it the first minute you heard it. You've searched for THAT sound and you have the dusty stack of pedals in the closet to prove it. And you've convinced yourself that whatever it is you're using right now is as close as you're ever going to get to THAT perfect sound. RMC built this pedal, the RMC8-Guitar Eqwahlyzer, for you. Your sound. THAT sound. The RMC8 begins with the proper sonic foundation. The classic Plunkett design, used by permission, blueprinted from an Italian original. A small toggle switch located under the rocker lets you change the sweep contour from the fast response of an "NOS Icar-taper" pot to the slow, expanded range articulation of the "aged Icar-taper" ROC-POT 5.2 wah pot. The tone-shaping capability continues with the switchable 5-band graphic equalizer located on the front slope of the case. The EQ is within the wah circuit, only available when the wah is turned on, and then only if you want the EQ to be on. From lows to highs and in-between, you can shape your wah sound to be THAT sound, all in real-time. The RMC8 is all analog and built with double clad copper circuit boards, through-hole components in the wah circuit, surface mount components in the equalizer circuit, 5 bands of +/- 15 db equalization with center-detent sliders, LED indicator light for the EQ circuit so you know when the EQ is active, EMI resistant Karmaflux inductor, heavy-duty Italian true-bypass on/off switch, dependable one million cycle ROC-POT 5.2 wah potentiometer, and case-mounted input and output jacks. The RMC8-Guitar Eqwahlyzer is housed in our new extended wah shell with a silk-screened bottom plate, multi-sparkle graphite grey finish, and topped with a black footpad. Your sound, THAT sound, is here. You'll know it as soon as you step on it.